If only someone had the answer to the age old question; how do I make a career as an artist? The harsh reality is—you can’t. Owning your own quilt shop is about the closest thing to monetizing a creative endeavor as you can get, and I’m sure we all count that blessing when we take time to appreciate the things we have. But some days it’s really hard to appreciate! Being a small business owner is a lot of work, and there are both mundane and difficult tasks that need to be done in order to keep the business going. The next time you have ten minutes to spare, watch this video with advice from Elizabeth Gilbert where she outlines the difference between hobbies, jobs, careers, and vocations. Gilbert outlines that out of those four words, the only thing you have to have is a job. And doesn’t that stink! But at the end of the day, everyone has one, regardless of if you were born into gentry or not. Don’t view your job as something that you have to love, because you don’t. That’s where hobbies come in. A hobby is something you like to do. But hobbies are also something you don’t have to love, just things you enjoy. Now a career is a job that you need to love. If you’re in a career and you don’t love it, I’m sure it’s terrible. A career is a job you’re willing to put more time and effort into because you truly believe in the cause. It is more than just a transaction where you put in work in order to get money to survive in the materialistic world. The thing that lets you contribute to the artistic world—the world we all so badly want to be more involved in—is a vocation. A vocation is the thing you were born to do. 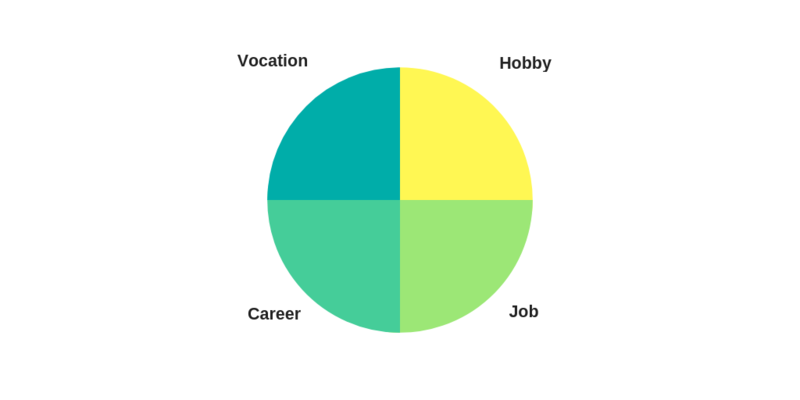 Although it takes a lot of self-discipline to remain true to your vocation (especially if you have a job), our vocation is the thing that provides the most meaning and fulfillment into our lives, and others. If you find yourself confusing what each of these words are to bring to your life, go back to the video. Hopefully it will bring you as much peace of mind and clarification the second time around.